Over the course of 28 minutes during Sunday night’s grand finale at 9pm, The Fields will go dark as the world’s largest experiment in empathy engineering unfolds at the Living Stage. Details surrounding FUTURO – X have been intentionally left shrouded in mystery and the only way to find out what it’s all about is to join us as we attempt to discover if empathy can be engineered. This year’s Living Stage is the first-ever stage to be constructed from hemp. The towering structure uses five tonnes of bundled hemp branches and is a minimalist monument in eco-design. 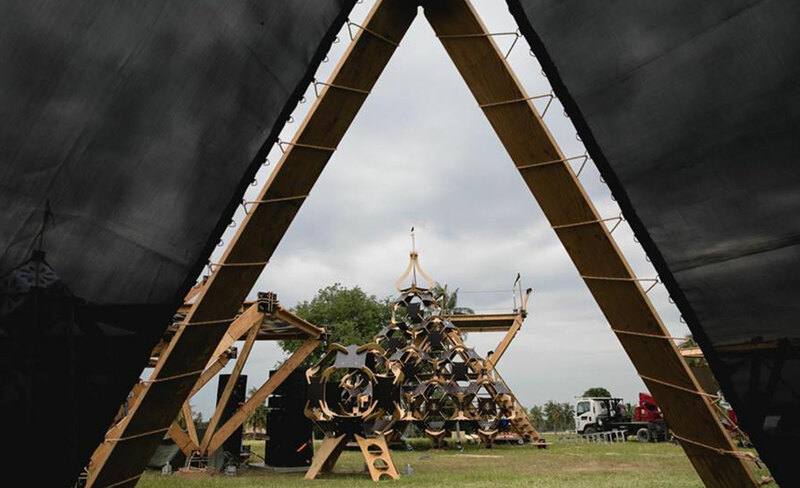 Dreamed up by Adam Pollina, he experimented with the material for some time before building up our main stage, which stands tall at nearly 15-meters and twice that in width. Headliners playing the stage this year include Goldie & The Ensemble, Nightmares on Wax (Live), Huun Huur Tu and Carmen Rizzo and Job2Do. The Solar Stage returns to The Fields for its fourth year but in a new form. Not only has it been reassembled in a new formation, but it has also been designed and positioned strategically to be line with both sunrise and sunset. Not-to-miss moments at Solar Stage include sunset with MEUTE on Saturday and sunrise with Craig Richards and friends on Monday. Sustainability is the foundation upon which Wonderfruit is built and that mantra runs strong throughout The Fields. The site utilized more than 50,000 bamboo poles in various sizes in its construction this year and even things like plates, cups, and cutlery are made up of materials like cassava and sugarcane.